This quotation emphasizes a balanced diet of grains, meat, fruit, and vegetables that supply nutrients and support health. The theory of Chinese medicine is applied in a holistic way that includes health cultivation, strengthening of the body, treatment and prevention of disease. Yin Yang theory is integral to holistic medicine and is part of all therapies used in Chinese Medicine. The Yellow Emperor’s Inner Classic explains how yin and yang relate to food, “temperature belongs to yang and taste belongs to yin, strong taste belongs to yin and light taste belongs to yang, spicy and sweet tastes effuse and scatter and pertain to yang, sour and bitter tastes upwell and drain and pertain to yin”. This is the basis of classifying food according to yin and yang. For example, ginger, garlic, chives, and so on pertain to yang due to their flavors and actions, but meat, bitter gourd, and so on pertain to yin due to their natures. Food is the Best Medicine! Eating the right foods can change your life, reversing the disease process in many conditions. Dietary therapy is essential to the treatment of obesity according to both Chinese medicine and biomedicine. Chinese medicine holds that food is the best medicine. The things we eat are natural substances that have their own unique qi (properties) just like Chinese medicinals. The properties of Chinese medicinals are used to correct any imbalance of qi, blood, yin, or yang. The properties of food can be used in a similar way. 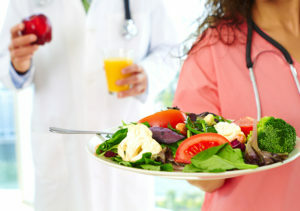 As much as possible, it is better to use food as medicine rather than taking any kind of medication. Food acts on the internal organs and influences the qi of the body, which can be used to preserve health and treat disease. The main difference between food and medicinals is that food is generally milder. That’s why food is taken daily and medicinals only when necessary. Properly chosen, food can be used as medicine. Some Chinese medicinals can be used as food and added into your diet. Indeed, many common spices (cinnamon, cardamon, ginger, garlic) are commonly used in herbal treatment. In Chinese medicine, the line between food and medicine is a blurry one. Hot food like peppers and chilies have a warming effect on the body, while cold food like tomatoes and bananas can cool the body. Neutral food doesn’t have much influence on the body, and is an important part of maintaining a healthy balance. For example, rice is neutral and thus can be consumed daily, providing nourishment while not having a drastic effect on the body’s function. 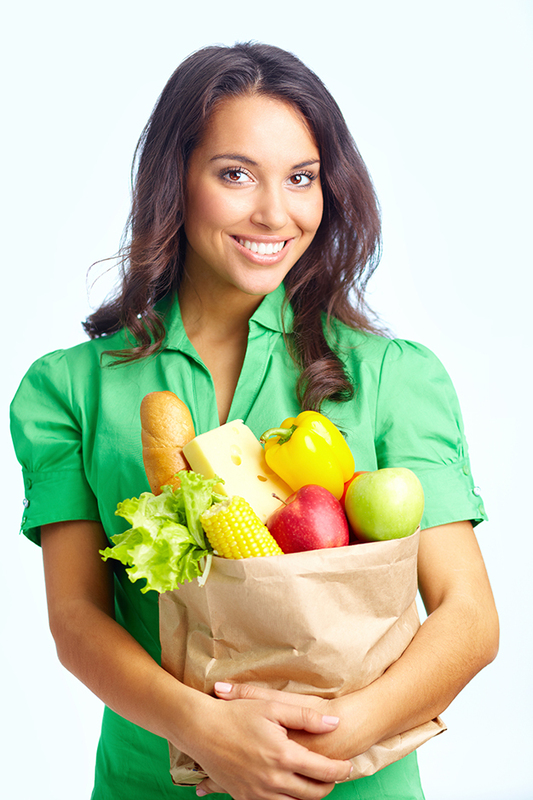 Making wiser choices with the foods you buy each week can make a huge difference in your health. Each food item has its own properties and is selected based on the patient’s pattern to treat disease or preserve health. The theory of the four temperatures and five tastes guides the administration of medicinals and food. The five tastes or flavors are spicy, bitter, sweet, sour, and salty. The four temperatures are cold, hot, warm, and cool. Warm and hot belong to yang and cold and cool belong to yin. In addition, some food and herbs are considered to have a neutral temperature. In general, hot and warm food warm the channels, arouse yang and qi, promote blood flow and disperse cold. Cold and cool food nourish yin, clear heat, purge fire, cool the blood and detoxify. The different tastes or flavors have different actions. Spicy food is used to disperse, sour to receive and restrain, sweet to strengthen and moderate, bitter to purge and dry, and salty to soften and relax. To eat a balanced diet, in terms of Chinese medicine, is to balance the qi of the food. A diet too lopsided in one direction or the other for too long will eventually cause an imbalance of qi, blood, yin and/or yang. For those already suffering from disease, special food is chosen based on the patient’s individual condition. Dietary prescriptions in Chinese medicine are made according to individual pattern identification. Biomedicine calculates the calories, vitamins, fat content, etc. precisely. When combined, a very well designed dietary regimen is possible. 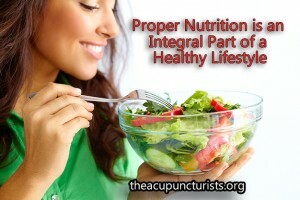 The flavors of food are associated with the internal organs, and influence them just like medicinals do. The essence of Chinese dietary therapy is to choose proper food items and add certain medicinals to the diet that will help to restore the body’s harmony. In Chinese medicine, regulating the diet means matching food with a person’s internal conditions and the external environment. This means that cold, hot, warm, and cool must be in harmony. For example, in summer people should drink mung bean soup because its cool flavor and can relieve summer heat and prevent summertime flu, but in winter it is better to have rice bean soup due to its warm flavor. It is also beneficial to balance individual recipes so that individual temperatures are not too strong. When cooking crab, some ginger should be added to moderate the cold nature of the crab. Many people who are overweight have heat in the stomach as well as internal dampness and phlegm. These patients should eat bitter melon to clear the heat from the stomach. But the bitter and cold nature of bitter melon can damage the digestive system. When the digestive system is damaged more dampness and phlegm can be generated. So garlic should be cooked with the bitter melon to moderate the coldness. To eliminate phlegm and dampness many doctors tell their patients to eat white gourd. But too much draining of dampness will damage qi. Therefore it is wise to cook a little meat with the white gourd to support the qi. Biomedical nutritional therapy separates food by content: carbs, protein, fat, vitamins, etc. Chinese medicine concentrates on the qualities of each food item, dividing food into the categories of taste and temperature. As an example, biomedicine would put most grains in the same category due to their carb content. Chinese medicine, while also recognizing familiar fod categories like grains, meat, vegetables, etc., also divides grains into different categories based on their temperature and taste. Looking at food from the Chinese perspective, beef, onions, and walnuts are all considered warm. Biomedicine on the other hand, would find little in common with these three foods. With the combination of modern nutrition and Chinese dietary theory, food therapy can be very effective. THE 5 ENERGIES OF FOODS – Here are some examples of common foods with different energies. Yin Cold Bamboo shoot, banana, bitter gourd, clam, crab, grapefruit, kelp, lettuce, muskmelon, persimmon, salt, sea grass, seaweed, star fruit, sugar cane, water chestnut, watermelon and lotus root. Yin Cool Cucumber, apple, barley, bean curd, chicken egg white, Chinese wax gourd, common button mushroom, eggplant, Job’s tears, lily flower, loquat, mandarin orange, marjoram, mung bean, oyster, pear, peppermint, radish, sesame oil, spinach, strawberry, tangerine, wheat, wheat bran, cream, yogurt and cheese. Balanced yin and yang Neutral Corn, abalone, apricot, beef, beetroot, black fungus, black sesame seed, black soybean, cabbage (Chinese), carp, carrot, castor bean, celery, chicken egg yolk, cuttlefish, dry mandarin orange peel, duck, fig, grape, honey, horse bean, kidney bean, kohlrabi, licorice, lotus fruit and seed, milk, olive, oyster, papaya, peanuts, pineapple, plum, rice, pork, potato, pumpkin, radish leaf, red bean, rice bran, Japanese mushroom, sour plum, sunflower seed, sweet rice, sweet potato, taro, white fungu, sugar, yellow soybean. Yang Warm Chicken, apricot seed, brown sugar, caraway, carp, cherry, chestnut, chive, cinnamon twig, clove, coconut, coffee, coriander (Chinese parsley), date, dillseed, eel, fennel, garlic, ginger (fresh), ginseng, grapefruit peel, green onion, guava, ham, kumquat, leaf mustard, leek, litchi, longan, maltose, mutton, nutmeg, peach, raspberry, rosemary, shrimp, spearmint, squash, star anise, sweet basil, sword bean, tobacco, vinegar, walnut, wine. Yang Hot Pepper, cinnamon bark, cottonseed, ginger (dried), soybean oil, red and green pepper. We look forward to working with our patients on an holistic level addressing the root causes of disease and natural ways of healing. Consultations are always free so give us a call today!